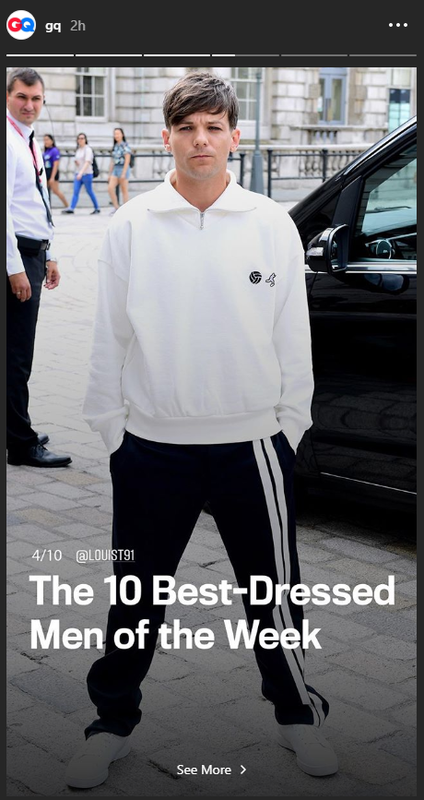 Louis Tomlinson made GQ's 10 Best Dressed Men of the Week list, appearing on their Instagram story. Louis' outfit that he wore to the X Factor Launch press conference won raves and earned him a spot on GQ's list. The outfit, which was recently featured in our Saturday Swag, consisted of a Gosha Rubchinskiy football turtleneck sweatshirt and Valentino side stripe track pants. The outfit was featured on Upscale Hype's Instagram as well. Louis is known for his comfy, upscale, designer looks, often spotted wearing Gucci, Vetements, Gosha Rubchinskiy, Valentino, Adidas, and Saint Laurent. His styles have been featured on male fashion blogs like Steal His Outfit, Star Style Man, and Pause Magazine. He's been featured in fashion spreads in The Guardian , Noisey, and SID Magazine, which did several releases to keep up with demand for Louis' spread. He also posed in Polari for High Snobiety.